In early December I spent a couple of rainy hours one Saturday morning in a rehearsal room at the University of Washington Dance Department. 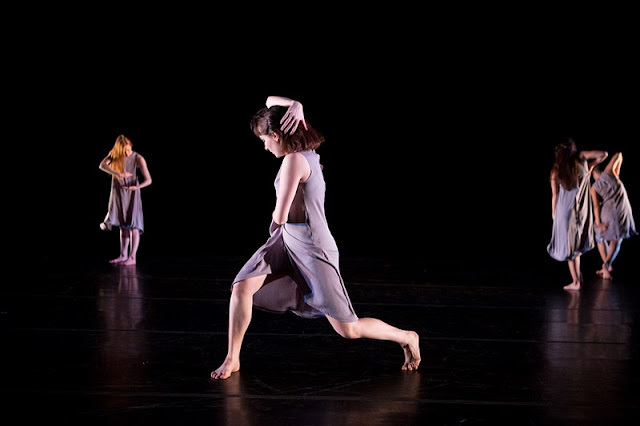 I was there to watch choreographer Zoe Scofield work with 20 undergraduate students. Scofield is the inaugural recipient of the Kawasaki Guest Artist fellowship. She was fine tuning her residency project, a dance she called “How come he gets to ride while we have to walk? (Hey GIRL!). Scofield had been working on the piece for a few months by the time I saw it; she was sick that morning, feeling bleary. The students straggled into the studio one by one, and I could tell this wasn not at all how she was accustomed to working. But the rehearsal started, and when they finally ran the dance, I got that little prickle of excitement, my spidey sense, that tells me I’m watching something special. 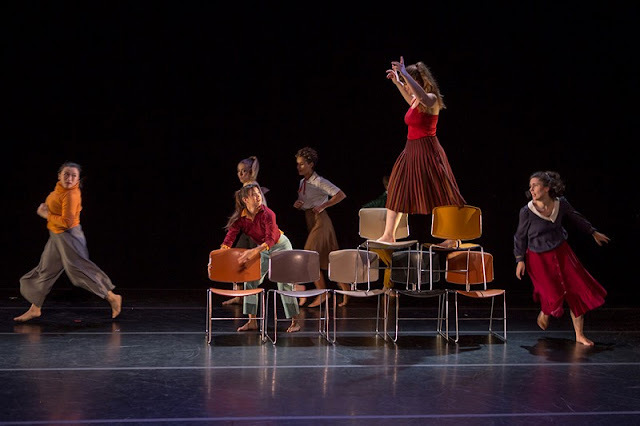 UW dance students in Rachael Lincoln's "Shrinking Violet"
I’m always thrilled to watch large groups of dancers moving together, and 20 certainly fits that description. The performers were dressed in loose gray shift dresses that flowed from their shoulders and swung gracefully around their knees. In a way, the costumes were metaphors for the freedom the young women sought throughout the dance. “How come he gets to ride…” (great title) begins with the performers in staggered rows across the floor, counting out their steps in unison. One by one, dancers break free from the regimentation to move to what seems an inner melody. Scofield then breaks the ensemble into sub-groups. A half dozen women, arms linked, move in a horizontal line across the floor, the formation reminiscent of Henri Matisse’s 1910 painting “Dance.” Different combinations of women repeat this sequence, while others come forward to express themselves individually, their movements a counterpoint to what seemed like the dance equivalent of a Greek chorus. At one point the entire ensemble lays supine, raising bent legs, then folding them over the torsos of the dancers on their right. It felt like a more eloquent version of the June Taylor Dancers I used to watch on television in the 1960’s. The most emotionally resonant moment for me was, seemingly, the loosest. Freed from counting out beats, from moving in unison, the pack of young women tears wildly around the stage, with flying manes of hair and sporting huge grins. They’re like children released from stuffy classrooms on the all-too-rare sunny afternoon. Instead of a schoolroom, these young women have been released from expectations, from self-discipline, from self-consciousness. It made me want to weep, for its beauty and for what it says about the all the possibilities that lie ahead for these undergraduates. I have no idea whether these dance students enjoyed performing Scofield’s work, but I do know how much I relished watching them do so. Partly to witness the performance itself, but more to soak in Scofield’s mastery of her craft. She told me after the show that there were things she would have done differently (she was away from Seattle for most of the month prior to this performance). Maybe so. But “How come he gets to ride while we have to walk? (Hey GIRL!) demonstrated Scofield’s skill as a dance-maker: crafting transitions, melding movement and music, assembling dancers on a stage then moving them in such a way that carries the audience on a journey. Even more than that, is something Scofield and her artistic partner Juniper Shuey have delivered so well for more than a decade: creating thoughtful reflections on the wide, wide world and our place within it.